Crawford Family Wines embraces the "garagiste" style of winemaking by producing tiny lots of Pinot Noir, Chardonnay and Syrah that provide a glimpse into the unique Sta. Rita Hills vineyards they come from. Striving for authenticity in varietal character and a sense of place, we employ a minimalist approach to winemaking and let the fruit do the talking. 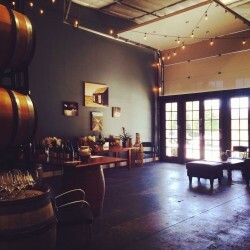 Centrally located in Buellton, we are a winery well worth seeking out. Come taste micro-production lots of Pinot Noir, Chardonnay and Rhone varietals in an authentic industrial winemaking space.